Simon Says Stamp and Show: The Final Countdown! You have now met the team ... you have probably seen oodles of little peeks at tomorrow's amazing challenge prize ... now here I am to show you the prize in all of it's glory! 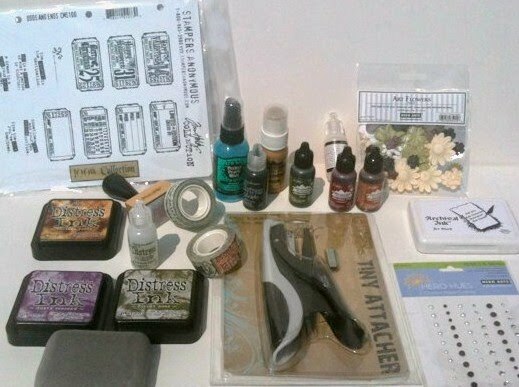 Yes that is a Tiny Attacher you can see and Yup those are Tim Holtz Stamps ... all rather yummy stuff ... all donated by our very generous site sponsor ... Simon Says Stamp! So how can you win??? ... All you need to do is take part in the very first ever ever Simon Says Stamp and Show weekly Challenge. This amazing prize will be awarded at random to one of the lucky people who join in this week. We also have a fabulous Top 3 blinkie which will be given to the Design Team's favourite entries on a weekly basis. In addition to all of that we have lots of inspiration for you ... this is going to be sooooooooooo much fun! See you soon! Getting excited now - what time will it be in the UK when the challenge goes live? OH MY GOODNESS....I am drooling!! Can't wait! I can't wait either - am sooooo looking forward to this - even without prizes, although it's always nice to have the chance to win something and these look so generous! ARE YOU READY ladies & Gents??!???! Get your "CRAFTY" on and....have a blast creatin'. Can't wait to see your "STUFF"!!! Cool! So about what time will we see this in the U.S.? Can't wait to see all the amazing creations that will be entered into this awesome new challenge! Best of luck to all! How did you know i'm craving a tiny attacher???? love the prize, great past photos! did i miss something? what are we supposed to do? where is the challenge posted and all that info? thanks for the help. Simon Says Stamp and Show your Layers! It's Wednesday ... and Here are the winners! Anything ... Lord Tim of Holtz inspired! Generous Wendy Vecchi Adds Prize! THE Wendy Vecchi - Studio 490 Style! Meet the Team! Last but not Least! Meet The Team! Day Two!